Hi Alaska, I appreciate speaking directly TO you, the people I serve, as your Governor (New Road, 2009, ¶1). People who know me know that besides faith and family, nothing’s more important to me than our beloved Alaska. Serving her people is the greatest honor I could imagine (New Road, 2009, ¶2). I want Alaskans to grasp what can be in store for our state. We were purchased as a territory because a member of President Abe Lincoln’s cabinet, William Seward, providentially saw in this great land, vast riches, beauty, strategic placement on the globe, and opportunity. He boldly looked “North to the Future”. But he endured such ridicule and mocking for his vision for Alaska, remember the adversaries scoffed, calling this “Seward’s Folly”. Seward withstood such disdain as he chose the uncomfortable, unconventional, but RIGHT path to secure Alaska, so Alaska could help secure the United States (New Road, 2009, ¶3). Alaska’s mission – to contribute to America. We’re strategic IN the world as the air crossroads OF the world, as a gatekeeper of the continent. Bold visionaries knew this – Alaska would be part of America’s great destiny (New Road, 2009, ¶4). Our destiny to be reached by responsibly developing our natural resources. This land, blessed with clean air, water, wildlife, minerals, AND oil and gas. It’s energy! God gave us energy (New Road, 2009, ¶5). So to serve the state is a humbling responsibility, because I know in my soul that Alaska is of such import, for America’s security, in our very volatile world. And you know me by now, I promised even four years ago to show MY independence… no more conventional “politics as usual” (New Road, 2009, ¶6). And we are doing well! My administration’s accomplishments speak for themselves. We work tirelessly for Alaskans (New Road, 2009, ¶7). We aggressively and responsibly develop our resources because they were created to be used to better our world… to HELP people… and we protect the environment and Alaskans (the resource owners) foremost with our policies (New Road, 2009, ¶8). We created a petroleum integrity office to oversee safe development. We held the line FOR Alaskans on Point Thomson – and finally for the first time in decades – they’re drilling for oil and gas (New Road, 2009, ¶10). We have AGIA, the gasline project – a massive bi-partisan victory (the vote was 58 to 1!) – also succeeding as intended – protecting Alaskans as our clean natural gas will flow to energize us, and America, through a competitive, pro-private sector project. This is the largest private sector energy project, ever. THIS is energy independence (New Road, 2009, ¶11). And ACES – another bipartisan effort – is working as intended and industry is publicly acknowledging its success. Our new oil and gas “clear and equitable formula” is so Alaskans will no longer be taken advantage of. ACES incentivizes NEW exploration and development and JOBS that were previously not going to happen with a monopolized North Slope oil basin (New Road, 2009, ¶12). We cleaned up previously accepted unethical actions; we ushered in bi-partisan Ethics Reform (New Road, 2009, ¶13). We also slowed the rate of government growth, we worked with the Legislature to save billions of dollars for the future, and I made no lobbyist friends with my hundreds of millions of dollars in budget vetoes… but living beyond our means today is irresponsible for tomorrow (New Road, 2009, ¶14). We took government out of the dairy business and put it back into private-sector hands – where it should be (New Road, 2009, ¶15). We provided unprecedented support for education initiatives, and with the right leadership, finally filled long-vacant public safety positions. We built a sub-Cabinet on Climate Change and took heat from Outside special interests for our biologically-sound wildlife management for abundance (New Road, 2009, ¶16). We broke ground on the new prison (New Road, 2009, ¶17). And we made common sense conservative choices to eliminate personal luxuries like the jet, the chef, the junkets… the entourage (New Road, 2009, ¶18). We are doing well! I wish you’d hear MORE from the media of your state’s progress and how we tackle Outside interests – daily – SPECIAL interests that would stymie our state. Even those debt-ridden stimulus dollars that would force the heavy hand of federal government into our communities with an “all-knowing attitude” – I have taken the slings and arrows with that unpopular move to veto because I know being right is better than being popular. Some of those dollars would harm Alaska and harm America – I resisted those dollars because of the obscene national debt we’re forcing our children to pay, because of today’s Big Government spending; it’s immoral and doesn’t even make economic sense (New Road, 2009, ¶20)! Another accomplishment – our Law Department protected states’ rights – TWO huge U.S. Supreme Court reversals came down against that liberal Ninth Circuit, deciding in OUR state’s favor over the last two weeks. We’re protectors of our Constitution – federalists protect states’ rights as mandated in 10th amendment (New Road, 2009, ¶21). Some say things changed for me on August 29th last year – the day John McCain tapped me to be his running-mate – I say others changed (New Road, 2009, ¶23). Let me speak to that for a minute (New Road, 2009, ¶23). Political operatives descended on Alaska last August, digging for dirt. The ethics law I championed became their weapon of choice. Over the past nine months I’ve been accused of all sorts of frivolous ethics violations – such as holding a fish in a photograph, wearing a jacket with a logo on it, and answering reporters’ questions (New Road, 2009, ¶24). Every one – all 15 of the ethics complaints have been dismissed. We’ve won! But it hasn’t been cheap – the State has wasted THOUSANDS of hours of YOUR time and shelled out some two million of YOUR dollars to respond to “opposition research” – that’s money NOT going to fund teachers or troopers – or safer roads. And this political absurdity, the “politics of personal destruction” … Todd and I are looking at more than half a million dollars in legal bills in order to set the record straight. And what about the people who offer up these silly accusations? It doesn’t cost them a dime so they’re not going to stop draining public resources – spending other peoples’ money in their game (New Road, 2009, ¶25). It’s pretty insane – my staff and I spend most of our day dealing with THIS instead of progressing our state now. I know I promised no more “politics as usual,” but THIS isn’t what anyone had in mind for ALASKA (New Road, 2009, ¶26). If I have learned one thing: LIFE is about choices (New Road, 2009, ¶27)! And one chooses how to react to circumstances. You can choose to engage in things that tear down, or build up. I choose to work very hard on a path for fruitfulness and productivity. I choose NOT to tear down and waste precious time; but to build UP this state and our country, and her industrious, generous, patriotic, free people (New Road, 2009, ¶28)! Life is too short to compromise time and resources… it may be tempting and more comfortable to just keep your head down, plod along, and appease those who demand: “Sit down and shut up”, but that’s the worthless, easy path; that’s a quitter’s way out. And a problem in our country today is apathy. It would be apathetic to just hunker down and “go with the flow” (New Road, 2009, ¶29). Nah, only dead fish “go with the flow” (New Road, 2009, ¶30). No. Productive, fulfilled people determine where to put their efforts, choosing to wisely utilize precious time… to BUILD UP (New Road, 2009, ¶31). And there is such a need to BUILD up and FIGHT for our state and our country. I choose to FIGHT for it! And I’ll work hard for others who still believe in free enterprise and smaller government; strong national security for our country and support for our troops; energy independence; and for those who will protect freedom and equality and LIFE… I’ll work for and campaign for those PROUD to be American, and those who are INSPIRED by our ideals and won’t deride them (New Road, 2009, ¶32). I WILL support others who seek to serve, in or out of office, for the RIGHT reasons, and I don’t care what party they’re in or no party at all. Inside Alaska – or Outside Alaska (New Road, 2009, ¶33). But I won’t do it from the Governor’s desk (New Road, 2009, ¶34). I’ve never believed that I, nor anyone else, needs a title to do this – to make a difference… to HELP people. So I choose, for my State and my family, more “freedom” to progress, all the way around… so that Alaska may progress… I will not seek re-election as Governor (New Road, 2009, ¶35). And so as I thought about this announcement that I wouldn’t run for re-election and what it means for Alaska, I thought about how much fun some governors have as lame ducks… travel around the state, to the Lower 48 (maybe), overseas on international trade – as so many politicians do. And then I thought – that’s what’s wrong – many just accept that lame duck status, hit the road, draw the paycheck, and “milk it”. I’m not putting Alaska through that – I promised efficiencies and effectiveness! ? That’s not how I am wired. I am not wired to operate under the same old “politics as usual.” I promised that four years ago – and I meant it (New Road, 2009, ¶36). It’s not what is best for Alaska (New Road, 2009, ¶37). I am determined to take the right path for Alaska even though it is unconventional and not so comfortable (New Road, 2009, ¶38). With this announcement that I am not seeking re-election… I’ve determined it’s best to transfer the authority of governor to Lieutenant Governor Parnell; and I am willing to do so, so that this administration – with its positive agenda, its accomplishments, and its successful road to an incredible future – can continue without interruption and with great administrative and legislative success (New Road, 2009, ¶39). My choice is to take a stand and effect change – not hit our heads against the wall and watch valuable state time and money, millions of your dollars, go down the drain in this new environment. Rather, we know we can effect positive change outside government at this moment in time, on another scale, and actually make a difference for our priorities – and so we will, for Alaskans and for Americans (New Road, 2009, ¶40). Let me go back to a comfortable analogy for me – sports… basketball. I use it because you’re naïve if you don’t see the national full-court press picking away right now: A good point guard drives through a full court press, protecting the ball, keeping her eye on the basket… and she knows exactly when to pass the ball so that the team can WIN. And I’m doing that – keeping our eye on the ball that represents sound priorities – smaller government, energy independence, national security, freedom! And I know when it’s time to pass the ball – for victory (New Road, 2009, ¶41). I have given my reasons candidly and truthfully… and my last day won’t be for another few weeks so the transition will be very smooth. In fact, we will look to swear Sean in – in Fairbanks at the conclusion of our Governor’s picnics (New Road, 2009, ¶42). I do not want to disappoint anyone with my decision; all I can ask is that you TRUST me with this decision – but it’s no more “politics as usual” (New Road, 2009, ¶43). In fact, this decision comes after much consideration, and finally polling the most important people in my life – my children (where the count was unanimous… well, in response to asking: “Want me to make a positive difference and fight for ALL our children’s future from OUTSIDE the Governor’s office?” It was four “yes’s” and one “hell yeah!” The “hell yeah” sealed it – and someday I’ll talk about the details of that… I think much of it had to do with the kids seeing their baby brother Trig mocked by some pretty mean-spirited adults recently.) Um, by the way, sure wish folks could ever, ever understand that we ALL could learn so much from someone like Trig – I know he needs me, but I need him even more… what a child can offer to set priorities RIGHT – that time is precious… the world needs more “Trigs”, not fewer (New Road, 2009, ¶45). My decision was also fortified during this most recent trip to Kosovo and Landstuhl, to visit our wounded soldiers overseas, those who sacrifice themselves in war for OUR freedom and security… we can ALL learn from our selfless Troops… they’re bold, they don’t give up, they take a stand and know that LIFE is short so they choose to NOT waste time. They choose to be productive and to serve something greater than SELF… and to build up their families, their states, our country. These Troops and their important missions – those are truly the worthy causes in this world and should be the public priority with time and resources and NOT this local / superficial wasteful political bloodsport (New Road, 2009, ¶46). May we ALL learn from them (New Road, 2009, ¶47)! But I have given my reasons… no more “politics as usual” and I am taking my fight for what’s right – for Alaska – in a new direction (New Road, 2009, ¶50). Now, despite this, I don’t want any Alaskan dissuaded from entering politics after seeing this REAL “climate change” that began in August… no, we NEED hardworking, average Americans fighting for what’s right! And I will support you because we need YOU and YOU can effect change, and I can too on the outside (New Road, 2009, ¶51). We need those who will respect our Constitution where government’s supposed to serve from the BOTTOM UP, not move toward this TOP DOWN big government take-over… but rather, will be protectors of individual rights – who also have enough common sense to acknowledge when conditions have drastically changed and are willing to call an audible and pass the ball when it’s time so the team can win! And that is what I’m doing (New Road, 2009, ¶52)! Remember Alaska… America is now, more than ever, looking North to the Future. It’ll be good. So God bless you, and from me and my family – to ALL Alaska – you have my heart (New Road, 2009, ¶53). And we will be in the capable hands of our Lieutenant Governor, Sean Parnell. And Lieutenant General Craig Campbell will assume the role of Lieutenant Governor. And it is my promise to you that I will always be standing by, ready to assist. We have a good, positive agenda for Alaska (New Road, 2009, ¶54). In the words of General MacArthur said, “We are not retreating. We are advancing in another direction” (New Road, 2009, ¶55). A second term as Governor poses some significant disadvantages to Sarah Palin for a 2012 run and they relate mainly to timing. Governor Palin’s 2012 POTUS run would start in earnest around the same time as her second gubernatorial term. The first half of her second term would be devoted to balancing her duties with her campaign. Should Governor Palin win, Lieutenant Governor Sean Parnell would likely have to take over her duties for much of her term, or a special election might have to be held. This could turn Governor Palin’s local supporters against her, and reverberate through the campaign. The extreme distances between Anchorage/Wasilla and even Juneau and the political centers of the conterminous 48 states exacerbate this problem and could rapidly take a physical toll on the Governor. We are not certain as to whether she should run for a second gubernatorial term, at which point her POTUS campaign would begin, or if she should serve only her existing term and devote her future efforts to private sector work and full-time to a POTUS campaign should she choose to undertake it. This is a decision not to be taken lightly and we do not purport to have all the facts available to us with which to guide such a decision. This is a decision Governor Palin will need to make in consultation with her best advisers, her family, and ultimately with herself. From the foregoing, we see that Governor Palin has made her decision. She gave it careful consideration over the past several months. She recognized that like her forebear — Ronald Wilson Reagan — she could not continue to serve the people of her state if she was going to serve her country. Everything written in the SWOT document that this author and his colleagues composed is coming to pass. This was a brilliant move for Governor Palin on so many levels. Governor Palin resigned from a position of strength with a long list of accomplishments. Her administration already accomplished the goals it set forth. She recognized that now the Governor’s job is more a liability to her than an asset. The ethics complaints and other nonsense will stop. She elevated Sean Parnell, who will continue advancing the change she brought forth, ensuring that it sticks. She made the announcement on a slow news day and captivated the nation’s attention. She chose Independence Day to declare her independence. 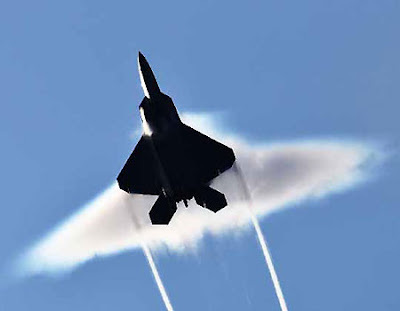 On June 22, 2009 this F-22 broke Mach 1 during a fly-by of the USS Stennis as part of Operation Northern Edge Exercises. Governor Palin visited that ship on the day this happened. 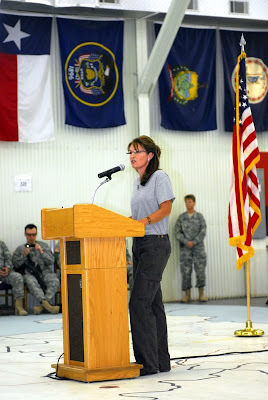 This author does not know if Governor Palin bore witness to this event or if a woman was piloting the plane….or both. 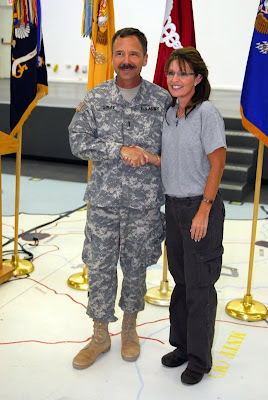 Here’s hoping this event was a sign of things to come for Governor Palin…. Greetings from Alaska where the fish are running and the sun is shining late! Not long ago, I had the opportunity to spend time with Governor Palin as we visited Central New York, Manhattan, Long Island, Washington, D.C. and Texas. It never ceases to amaze me that every time we travel together, virtually every moment of her time is spent talking to and caring for others, while listening to and learning from them as well – like brave, young Robert whose life we celebrated at the Autism Speaks Walk or the historical voices of the strong men and women upon whose shoulders we stand, including Harriet Tubman, Susan B. Anthony and former Secretary William H. Seward. Below, I attached a quick note from the Governor which she penned before leaving the country last week. I am attaching it to this memo because I am asking you to help Governor Palin and SarahPAC today! You have been so incredibly supportive and generous, and now we ask you again for your help – and we ask that you please also encourage your friends and family to give. SarahPAC needs to be in the position to help fund candidates who are going to fight for what we all believe – smaller government, less spending, and fewer taxes. With your help, we can take the Governor’s message and encourage others who also have hope and are firmly rooted in the conservative belief that you know how best to spend your money and not government. SarahPAC can’t do that without your help. 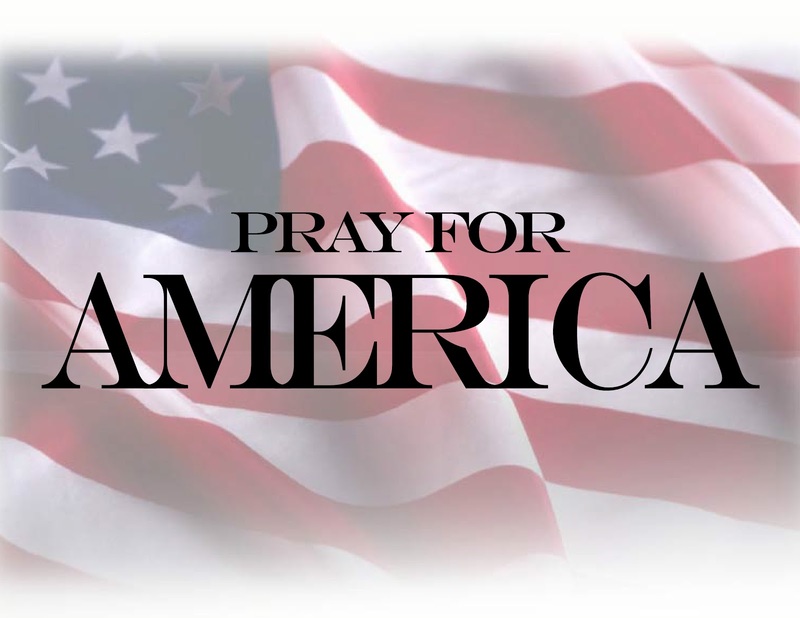 Please visit this link and give to SarahPAC today – and encourage others to do so as well. P.S. Please give before June 30th. Your help is critical. Visit this link to give! It is such a treat to talk to everyone about Alaska and hear stories of fishing, hunting, and camping. And it thrills me to hear from those who wish to visit our beautiful state! Alaska has much to offer – from her magnificent glaciers to her abundant natural resources to fuel our homes and businesses. When we travel outside Alaska, the hospitality is always overwhelming, and Todd and I so enjoyed meeting many new people on our recent trip to the Lower 48 – all emblematic of so many across this country who are willing to give of time, energy and effort to help one another. It was thrilling to see the look on both young and old faces as I traveled to New York, Washington, D.C. and Texas. Words can never express the incredible spirit of all those who dedicate their lives to making even one life more comfortable. Todd and I always recognize how grateful and proud we are to be citizens of the United States. We are so very blessed. The first photo speaks volumes. This is Transformational Leadership in action. 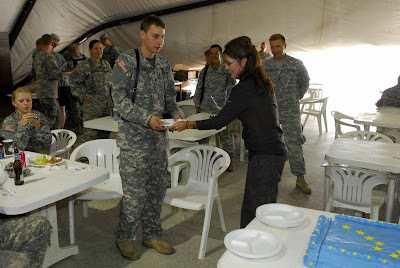 Governor Palin is cutting cake and serving it to her troops in that photo. Transformational Leaders see themselves as servants. They’re never self-absorbed. They have strong objective egos, and do not fancy themselves as divas, stars, holier than thou, or “more important.” They understand that continuing in their leadership position is contingent upon results — in fact, they go out of their way to ensure such. 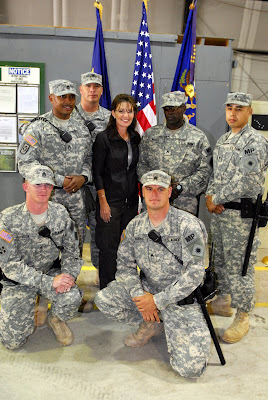 This theme continues with the next three photos showing Governor Palin’s meeting with children who learn English as taught by our soldiers volunteering their time, and a meeting with some of those volunteers. 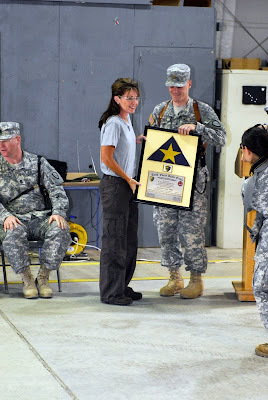 Governor Palin was honored with an Alaska State Flag, encased in a plaque box frame. The awarded flag had flown over Camp Bondsteel in regular service.